In other words, they once again want to experiment with Detroit school children. In Highland Park, the emergency manager’s operating plan for the district included turning over educational responsibilities to a charter school, while using existing property tax revenue to pay down accumulated debt. It seems that if Highland Park and Muskegon Heights emergency managers were able to make such changes, DPS could as well. 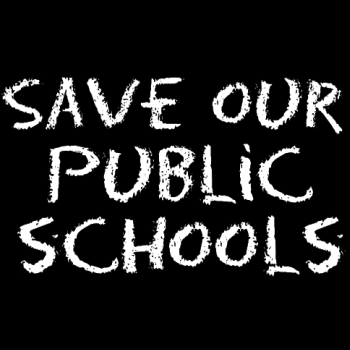 Rather than converting the district wholly into a single charter school district, the emergency manager could convert single schools individually, focusing on converting schools in need of the greatest educational and financial turnaround. Instead of having a single charter school operator run these schools, the emergency manager could contract with several operators to offer different programs and different management throughout the district. Indeed, the emergency manager could use converting schools as an opportunity to empower some of DPS’ best school leaders to head new, independent charter schools. This is the ALEC/corporate model for education of American kids where a roster of for-profit private education corporations assume responsibility for educating our kids, enriching themselves on our tax dollars and running schools on the cheap. One thing they don’t mention is that the model has been a colossal failure in Muskegon Heights. After Mosaica, the charter that took over their schools, discovered that they couldn’t reap the profits they expected, they bailed, leaving the district to pick up the pieces. The district is now reverting back to more local control. A side benefit of charter conversion would be to contain burgeoning teacher pension costs. Teachers hired on by new DPS charter schools would not have to participate in the state teacher pension fund, as is the case of most charter school employees. You can bet this means lower wages, as well. In the minds of these corporatists, teachers are an expense, an expense that they can reduce by making sure teachers don’t have a pension to rely on when they retire. Teachers spend their entire lives on the essential task of educating our children but, to the corporate world, it’s too much to ask that they be able to retire in dignity. This is the ALEC/corporatist model playing out right in front of us and it’s no surprise at all that the Mackinac Center is pimping it in Michigan. It is, after all, what they are paid so handsomely to do.